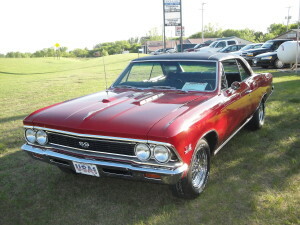 The body of the 1966 Chevelle was redone in a way that added sleeker more curvaceous lines in the design. Its front fender had a more aggressive design in which the top thrust forward to give it a more powerful look. The rear fenders were arched upwards in a way that gave the 66 Chevelle a distinctive coke-bottle look. This car’s design is considered one of the premier looks of the muscle car period. Looking at the front of the car, it’s broad grille was a new change in the car that was very popular and certainly added to the mystique of the look. Muscle car buyers of the sixties loved it. The hardtop models had the curved side windows and “flying buttress” roof line that muscle car lovers really love. In addition, this was the year in which the hardtop Sport Sedan was included in the Malibu series. It continued to have the 300, 300 Deluxe, and Malibu trim. Th is car was very popular in 1966. In fact, 412,155 vehicles were produced and of all the automobiles built, 72,272 were Super Sports. The demand was way higher than the 65 version. The types of body styles included the 2 door sports coupe, 4 door sports coupe, 2 door convertible, and the 4 door station wagon. No longer in the lineup was the two-door station wagon from the prior year. Sales was low for this car as it was discontinued for the 1966 model year. A higher performance SS 396 rolled off the assembly line with a standard 325 horsepower turbo-jet V-8 having an amazing engine displacement of 396 cubic inches. It came with special fender moldings, twin simulated hood air-intakes, and a darkened grill with very sharp looking SS 396 badges. You could also see the Super Sport script on the rear fenders. Very nice looking. This package also featured distinctive mag-type wheel covers and tires that were red striped. This rounded out the SS options. Bucket seats were optional in this vehicle. Most came with vinyl bench seats. For the power-hungry, they could choose a powerful 360 hp, 396 cubic inch motor ready to rock and roll. The engine also had dual exhaust with a better suspension system. Overall, this car provided better performance. Using the L34 engine, the 1966 Chevelle Super Sport could go from 0 to 60 mph in 7.9 seconds. The 1966 Chevelle is a very well-liked classic muscle car. The design still looks good today and is instantly recognized by enthusiasts and non-enthusiasts alike as a classic muscle car.